The silver-gilt mount cast, chased and engraved. This spoon may have been part of a set, and was probably valued as much for its materials as its function. Coral, fished from the coastal waters of Sicily, was prized since the Middle Ages for its magical power to ward off evil, and mother-of-pearl was an equally exotic material. The dolphin-like creature that joins the bowl to the handle recalls similar beasts on early-seventeenth-century goldsmiths' work from the Netherlands. 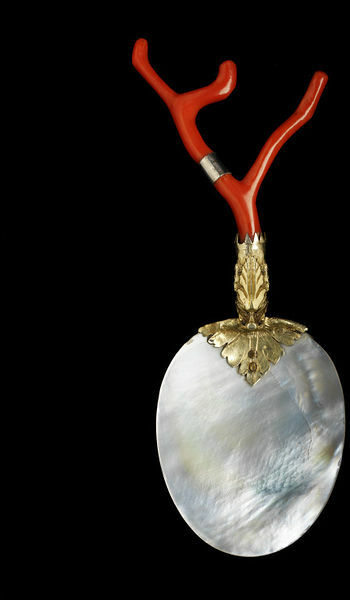 Two spoons with mother-of-pearl bowls are recorded in the 1694 inventory of the treasure collection at Rosenborg Castle (Denmark); a third, with a coral handle and gold bowl, was displayed in a case with other gold objects. 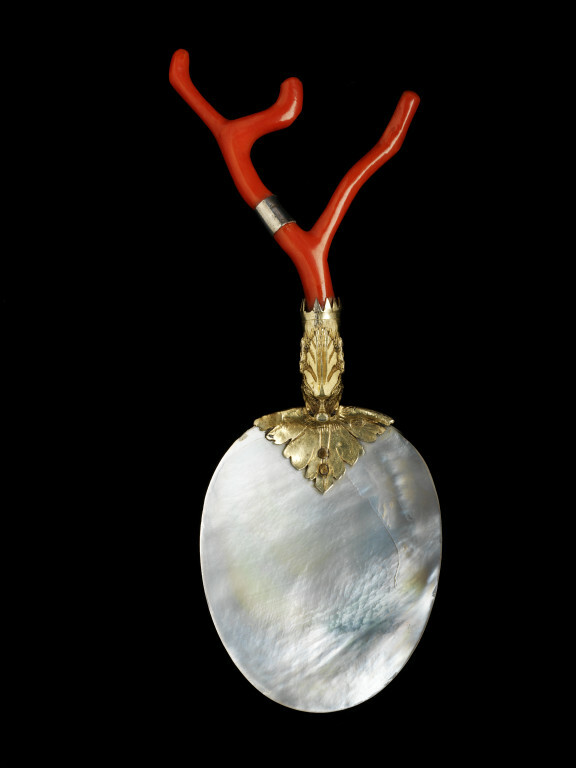 Spoon with mother-of-pearl bowl joined to a coral handle with a silver-gilt mount. Spoon, the bowl of mother-of-pearl, the handle coral (with a silver repair); the mounts gilded silver (unmarked). Tait, Hugh. Catalogue of the Waddesdon Bequest in the British Museum. 3 vols. (London: British Museum Press, 1986-1991), vol. III: The 'Curiosities' (1991). Tescione, Giovanni. Il corallo nella storia e nell'arte. Napoli: Montanino, 1965.